This week, communities all over our nation celebrated Veterans Day, which is a day we set aside to honor those who have served in our military forces throughout our history. For some, it may not rank up there with Christmas or Thanksgiving, or even the 4th of July but to a lot of men and women in this country, it is every bit as important as those other major holidays because they themselves are the reason we celebrate it and why we honor them for what they were willing to do to protect our freedoms and preserver our nation. 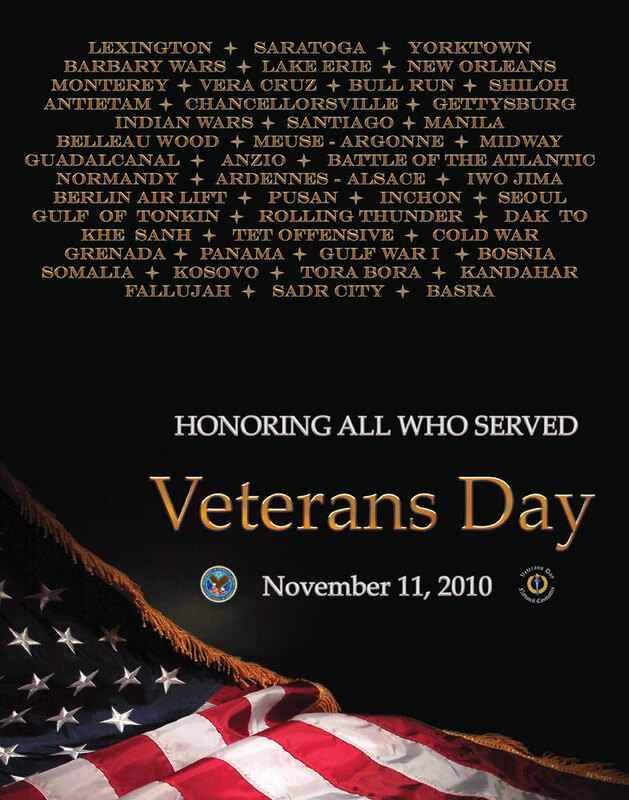 I have been fortunate in my life to have met many Veterans and have been related to quite a few. I have ancestors that have fought (and some who died) in most of the major wars that America has participated in, all the way back to the Revolution. All Veterans, those still living and those who have departed this life are part of an unbroken line of American Soldiers, Sailors, Marines, Airmen and Guardsmen that have stepped up to the front of the line and put themselves between all of us and certain disaster. They have guarded our shores, our oceans and our skies, serving both at home and on foreign soil, doing their sworn duty with honor, courage and a fortitude that most of us could never imagine. When I was born, we were at war in Vietnam. Some call it a “conflict” or a “police action” or other things, but let’s face it, it was a war. I don’t remember a lot about it because I was a child and because in this particular war, our armed services were fighting while life was going on pretty normally here. We didn’t have the material deprivation that those on the home front had in World War II to remind us that we were ALL in this together. We didn’t have to ration food, gasoline, apparel, tires, sugar and just about everything else that we take for granted and can so easily obtain at the local store. We didn’t have to drive the same car for many years because nobody built a car for four years. We often become removed from the realities of the wars that go on today because if we don’t want to hear about it, we can just turn off the television. I didn’t live through either one of the “Great Wars” but I knew (and still know) people who did, and they didn’t have the luxury to just turn it off like we do now. When I was growing up there were still Veterans of World War I living in my small hometown. They were all getting old then but they were proud men (I only knew men that served in that war) and you could spot them at any of the downtown events that we held to celebrate Memorial Day, Independence Day and Veterans Day. Some wore funny hats decorated with bright ribbons that most kids and more than a few of the adults there didn’t know were symbols of sacrifice and honor to these men. Today they are all gone from my community, reunited with those who stood by them in a hail of bullets and weren’t as lucky as they were. In fact, in the entire United States, there is only one living person who served in that war and as of this writing, he is 109 years old. So desirous to serve his nation was he that he lied about his age and enlisted at the age of 16. Across the entire world, there are a total of 3, all of them nearing the 110 mark. They will not likely live many more years and when the last of them have moved on, that war and all who fought in it will be consigned to history. In their lives, they saw the world they made safer become the modern world we live in today, yet they were a bridge to a distant past because many of them knew people from their own childhood who had fought in the Civil War. Perhaps knowing those old Veterans, from the North and the South, inspired them to serve with the same dignity and courage when their time came to step up to the plate. I knew a lot more Veterans of World War II and some of them are still with us today, both in my community and around the nation. Out of 16,112,566 serving members of the US armed forces in World War II, an estimated 2,079,000 are still living today and contributing to this country. Of this group, nearly 300,000 were women, more than any other war in our history, who served in the medical corps or intelligence corps. Only 18 Medal of Honor recipients from World War II survive to this day. The men and women of this time, a lot of whom fought in that war, have come to be known as “The Greatest Generation” because of the overwhelming contributions they made to American society both during the war and in the peacetime that followed. The veterans of that war went on to become some of our nation’s first astronauts like John Glenn and Deke Slaton; Presidents like Eisenhower, Kennedy and Reagan all saw wartime service and the list could go on and on. Other wars followed, such as Korea, Vietnam, the first Gulf War and the current war that is going on today in the Middle East. Between each one of them, there have been occasional armed conflicts where an American put their mission and the safety of their nation ahead of his or her own life. As a child, I always listened with respect any time a Veteran spoke and especially when they told of their experiences in war, often fighting in conditions that were hell at best and went downhill from there. As an adult, I still respect them and listen with interest whenever they choose to talk about what they did, which is rare. For many, those experiences can only be discussed with those who share them and can understand them. The older veterans become fewer and fewer with each passing year but they are part of the fabric of this nation, a fabric of red, white and blue, purchased with blood, sweat, tears and iron-willed determination to succeed. My grandfather fought in World War II and survived it to come home, start a family and make a good life for himself but he never forgot his experiences in that war and how they changed him. My other grandfather was too young to fight in the first World War and too old to fight in the second one but he lost one of his older brothers who died in France during the first one. My father was lucky because his eligibility for the draft during Vietnam was deferred due to my arrival but he always said that if he had been called up, he was ready to go if he was needed. I never had to fight in a war and I pray my son never has to either but the future is always uncertain. No matter what the future holds though, I know that men and women of this country will always be ready to rise to the challenge and serve their nation, in any time of need, both during war and during peacetime. They will become part of that long line of Veterans, just as those fighting in the Middle East are already a part of that line. Despite the politics of the world and despite the reasons for ever going to war, our Veterans deserve our respect and our admiration, our support and our encouragement for doing something noble so that others may have safety and peace of mind. They don’t do it for any other reason than patriotism and loyalty to their country and we owe them all the honor they deserve. My middle brother is a vet, though saved from bullets flying thank heavens. He’s retired now and ha and my sister-in-law belong to a vet’s motorcycle group in Northern California. He and others escorted the cremains of 3 vets across the country from our home town (Redding) to reburial in Arlington National Cemetery a couple of years ago. People came out all along the router – why aren’t stories like this shown on the news? – including a club of Buffalo Soldier vets who particularly honored the black Medal of Honor winner in the group. He had been found in a paupers grave behind the TB sanitarium in Arizona – that’s where penniless vets were sent to live out their lives at the time. Even though he won the nation’s highest award, he was denied a pension – it’s thought because of his race. Descendants of all 3 vets were at Arlington for the reburials and the motorcycle escorts formed honor guards at each ceremony. What an incredibly moving thing to do! The club now meets men and women returning from Irag or Afghanistan at the airport and forms an honor guard, lining both sides of the walkway with flags and salutes. Can you imagine how good it makes those returning warriors feel? And their families? The club also provides escorts at the funerals of vets – another thing that helps the families their loved ones and not forgotten.